Merry Mareep! Pokemon One a Day, Series 2! When you're in bed and trying to fall asleep, what do you do? You count sheep. What do most people liken to sleeping in a comfy bed? Like sleeping on a cloud. 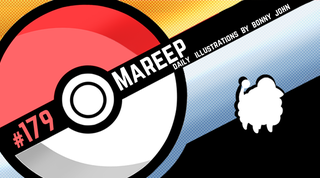 I put those two together, and this simple but effect illustration of Mareep was born! Today's illustration is real straight forward. Known as the wool Pokemon, the basic feature of Mareep is highlighted in a soft and delicate manner. I differentiated the body and the fur to have two different styles of shading to indicate texture. Soft gradual shading for wool, and hard shading for head and tail. As I said in the intro, two concepts come together to create a piece that really just sells itself. Mareep's whole body covered in wool (umm, as most sheep are) created a cloud of softness for the creature to fall asleep on. I removed the legs from view to help create a the image of endless wool to slumber into. There were no challenges or trying times for today's illustration. As you can see, things went swimmingly from start to finish...which makes for a boring write up, but it's just part of what I sell for One a Day! Let's wrap it up here. Mareep's an electric type because wool can get all static-y. Can you create another Pokemon from a real world animal that carries a subtle typing that you wouldn't make a connection to right away?